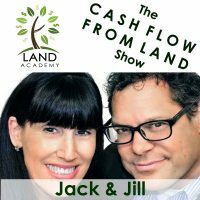 Steven Butala: Today, Jill and I talk about how to buy the property the same day the seller calls back. Jill DeWit: Like the same phone call. Steven Butala: Same call would be perfect. Jill DeWit: Yeah. Sometimes you can, sometimes you can’t. We’ll talk about that. Jill DeWit: Even for us. Jill DeWit: We have people that have lost deals us buying them, because we got bored and moved on. Steven Butala: Yeah, because they’re not responding fast enough. Stuff just changes. Ask any person in sales. You just got to close right then. Jill DeWit: If you can. You got it. Steven Butala: Before we get into it thought, let’s take a question posted by one of our members on the LandIntestors.com online community. It’s free. Jill DeWit: Gary asks, “Hello, Land Investors. Trying to nail down the best process for exchange of purchase funds and land ownership docs. When I sell properties, my buyers have been very hesitant and downright unwilling to send in the purchase price of the land without an escrow company, because, obviously, they bring up the fact that I could take their money and not send them a warranty deed and transfer docs. I see their point, so I’ve been using the procedure listed below. First of all, I got to say, not a crazy workaround. I get it. I think I know why this is happening. Because, he’s not established. We never have to do this, because of how many documents we’ve done, how many properties are available on our website. All that stuff. It’s very easy for the people that are buying from us to go, “Oh, boy, are they legit.” It’s like when you start a brand new eBay account and you have only one closed transaction. Yeah, people are not going to feel comfortable. Or, it’s you have zero closed transactions. I totally understand that. But, if you’re looking at some seller’s eBay account and you’re one of 15,000. Okay. I don’t worry about you. I know you’re legitimate, you’re established. I can see your rating. I can see your comments. I can see all of that good stuff. I think that’s what’s going on. I think that it’s only going to take some time to get there. However, a couple you can do ahead of time. Number one, put a lot of property on your website. As you’re buying your property, put them up there and keep them up there. Mark them as sold. Don’t pull them down, is you only have like three available that show up. Maybe you’ve done 10 transactions. Show the eight that you’ve sold, and these are the two that are left, you know? Maybe even consider doing a rating system or some kind of a system, a comments section on your website for your buyers. All those things are going to add credibility. Another thing is make sure your website links to your social media, links to you, links into your LinkedIn account. All of that good stuff to show that you, Gary, are a real person. Even if this is your side business, but you work for ABC Company over there. They can see that you’re a real person. All of this is going to make everyone feel more at ease while you build up your credibility and all of that. Steven Butala: I 100% concur. Steven Butala: Gary answered his own question here. I think that there’s nothing wrong with closing deals the way that you described every single time. I’ll add this. If you took credit cards on your website and posted the property on your website the way that we do at LandStay, then none of this would be an issue at all. Because, people are very used to just clicking on the credit card and then waiting for the package to arrive like Amazon. Jill DeWit: You’re right. I think you’re right, because paying by credit card gives you some sense of security. An out. Jill DeWit: Because, most credit card companies will back you up if you say … I think all will. Jill DeWit: “I didn’t get it. I need to cancel the charge.” That’s part of using a credit card. Steven Butala: It’s not me. It’s this person, is I made good on it. Steven Butala: It’s a win-win situation, I think, for everyone. It gives them a sense of stability, and it also gives you recourse if something goes sideways. I can count, in the 16,000 deals we’ve done, on one hand how many times we’ve had issues with this. Jill DeWit: Right. It’s stuff that you can undo. If there are any crazy things, you can fix it. Steven Butala: Right. Today’s topic: How To Buy Property the Same Day the Seller Calls and Why It’s Important. This is the meat of the show. Jill, you had a perfect explanation, before we started the show today, of what this really means and why it’s important. Why is it important? We send a bunch of mail out. A guy calls back and says, “You know what? I talked to my wife. We want to do the deal. Every year we have this conversation, so tell me what to do next.” What do you say? Jill DeWit: Well, if I can, I’m just going to make it happen right there. It’s just too easy when he says, “You know what? Hi. I got your letter. I’ve been thinking about it. Mulling it over for two weeks, and yes, we accept,” kind of thing. While he’s excited and you have him on the phone, he’s interested, just get all the information in a perfect world, and you just get it done. Here’s a couple things. Number one, I know what mail has gone out. So, when he calls me, I already have an idea … Well, not necessarily, too. Let me back up here. Right now, I’m thinking of House Academy where I’m sending a bunch in the same area. Those I kind of know, and those are no-brainers. For my Land Academy calls, they’re coming in from years ago, so they’re all over the country. What am I doing while I’m on the phone with the guy? I’m asking him … He’s like, “Hi. I got your letter.” “Great. Where is it? I have a checklist.” While I’m talking to him on the phone, I’m pulling up the property and looking at it. Jill DeWit: Let’s say how do you do this? You don’t just say, “Okay,” and just blindly trust him. No. What I’m saying is you’re on the phone with him for not long. You could do this in 10, 15 minutes. While you’re having the discussion with him, you’re pulling it up on ParcelFact.com. Steven Butala: Yeah. My favorite thing to do, by the way. Jill DeWit: You’re looking at it. You’re confirming the access. You’re confirming the owner name. Jill DeWit: He’s right there talking to you. The only questions that really are going to have that you could still do a lot of the times right there real quick is the taxes. “Are you current in your taxes?” He says, “Yes.” Do I take his word for it? No. Seriously. I’m like quickly jumping into the county website, checking it myself. I can be doing this all while I’m on the phone with the seller. Steven Butala: Yeah, and you should be. Steven Butala: That’s what it comes down to is availability. Steven Butala: Yeah. Hopefully they’re retired or really available. Jill DeWit: “That’s all good. We’ll take care of everything else.” Then you hang up the phone. If you still needed a few minutes, you can go double-check the county website, “Yep, he is current on his taxes. Everything checks out. Yep, I can get a notary at that time. Everything checks out.” Just do all that work, basically. You’re all doing this, like this title of this show, all the same day. Steven Butala: This is the Jill show today. Steven Butala: I love this. Jill DeWit: Well, because I’m the one that does this work. Steven Butala: Jill, I’m so happy that … This is beautiful. Go ahead. Jill DeWit: Okay. Well, this is my part of what we do. Anyway. The only reason you’re calling the guy back is A, he lives is far away, the only notary is going to be out in that area once on Friday, so we need to confirm that’s okay. Or, Be, he forgot he has an HOA, and he owes $600, so we got to renegotiate. We need to factor that in here. Or, the taxes are way off, and he didn’t realize his wife really didn’t pay the last four years, or something like that. Steven Butala: Or, somebody’s on the deed that … There’s some problem, you know? Somebody’s on the deed that passed away. These things don’t happen that often, and they’re the exception not the rule, but you got to check them all. Steven Butala: Then you have to go to the bank and get a cashier’s check, which I have despised my whole career. Jill DeWit: Isn’t that funny? Isn’t that so silly? Steven Butala: I don’t know why that’s a hard thing for you. Jill DeWit: Why is it? Oh, it’s not for you? Jill DeWit: Actually, too, because I don’t have to go do that anymore. Steven Butala: It just seems so 20th century. It’s just because the county recorders … For years, I researched on how to get a notarized document done online the way you sign stuff with DocuSign. It’s just not going to happen. The whole point to a notarization is you’re getting it … like it’s 1750 … to get somebody to witness … Our whole court system’s based on peers and witnesses and testimony. It’s rooted in all that, and there’s nothing you can do. Jill DeWit: I hear you. It would be easier. Can you imagine someday? This would be the dream. Someday when we hang up the phone and the seller, the buyer … Let me think here. I wire transfer the funds easily, which actually with Venmo and all those things, it’s coming, man. Jill DeWit: The money part is not the hard part for me to get the money to them. The hard part is them being able to … They have to have a notarized deed. It would be nice if … You’re right … a DocuSign deed, because I could just email it right over to the seller, have them do it online, and then it’s done. Because, then I can easily record online. Steven Butala: This is what I was thinking. This is a while ago. I’m glad we’re talking about this. Jill DeWit: Like video tape holding up his ID? Steven Butala: Yeah. Take a snapshot of that. “Here’s my ID,” or even scan it or … Then just watch the guy sign it on the video. Jill DeWit: Wouldn’t that be cool? Jill DeWit: … that the notary does. You do in front of a notary. Steven Butala: … in front of a notary. Yeah. Jill DeWit: It would be you. Steven Butala: No, it wouldn’t. Steven Butala: I won’t say abuse. I’ll say test. Jill DeWit: I am. You know what would be happening? You’d have a member of our staff holding up … like copy and paste your head on their body. “I am Steven Butala. This is me signing, because I don’t want to sign anymore.” That’s what would happen. Steven Butala: That’s exactly … Okay. I’m going to say this on the air. I shouldn’t say this. Jill DeWit: That’s what would happen. Steven Butala: For years, for years, I spent a ton of money … This was a lot of years ago … on a signature stamp of my own signature, because I had people … Totally different crew back then … and that’s how we would sign deeds. Jill DeWit: I didn’t hear that. Steven Butala: Yep. I didn’t even say that on the air. Jill DeWit: Well, here’s the whole thing that bothers me. It’s not like anybody’s pulling a fast one. We’re just trying to make it easier. Jill DeWit: There’s got to be a better way. I’m legitimately want to sell all this stuff. Steven Butala: We were signing 20 and 30 deeds a day. Steven Butala: You know what? I miss those days. Jill DeWit: Rolling your eyes at me? It still happens. Steven Butala: No, when it was just you and I and one assistant and some virtual assistants. Everything got done so fast and so efficiently. We just finish each other’s sentences, Jill. Even now we’re doing two deals. When a deal gets above half a million bucks net, Jill and I do it ourselves to make sure it gets done correctly. We hand-pick … We usually have the same title person, do the work. There’s a lot of contact with the seller when the deals are that big. In one particular case, this woman’s very emotional. She’s owned these properties … They’re houses that we will turn into subdivisions. Very, very emotional. Jill’s totally holding her hand. It’s kind of the house that she grew up in. In that situation … My whole point is we’re getting back to doing that together. Jill DeWit: A little bit. Steven Butala: Which, I really think is the root of all of this. Steven Butala: I like it. I like working with you. Jill DeWit: Well, let me back up, too. Let me say this is a perfect point topic to make with today’s show. Buying the property the same day the seller calls. It’s so nice, because when they call in and if you’re able to answer the phone, it’s you as the owner. You making the transaction. You having that relationship. Then you hang up the phone, and then your team does the rest. Jill DeWit: That’s really how this should go. Jill DeWit: You hand it over to your team, your assistant, who does the deed. Your assistant arranges a notary. Your assistant goes and gets a cashier’s check. Your assistant puts it in the mail. Your assistant … That’s your end of your responsibility. Because, you know what? Your team do it. They can send it out to them. They could set up the marketing for it. They could post it available. They’ll watch it come back in. They’ll send a recording. All that good stuff. Steven Butala: I don’t care who you are or how big or small your company is or your entity is, there are a couple things … two or three things, let’s say … that only you can do. That’s the reason that you’re at the top. We just identified what they are. For me, it’s to actually do the mail. In these cases, the deals that we’re doing right now, are actually processing these subdivisions all the way through. I could probably eventually hire somebody out, but I just know what to do. It’s a good use of my time, because I know it’s going to get done right. Jill DeWit: You’ll get [inaudible 00:17:07] faster, I think. Steven Butala: With you, that Jillification with these sellers and the trust that you establish with them. Steven Butala: I’ve never seen anybody else do it like that. I’m sure there’s people in our group that have established some version of it, but for whatever reason, it just works for us. Jill DeWit: It does. That’s true. Jill DeWit: It is. It is fun. Steven Butala: It’s fun to make a half a million dollars a deal. Jill DeWit: It is fun. That’s the goal. When you have them on the phone, look up the property, be talking to them. Have a little bit of a conversation. They’re good with that while you’re looking up, like, “Hey, you know what, Mr. Smith? Give me the [inaudible 00:17:42] again. I’m going to look it up right now.” They’re ready to do that. When they called you, they’re planning on this taking a few minutes. Jill DeWit: You don’t want to talk to their brother-in-law who says, “Well, heck, I’ll give you $200 more than that for it.” You want to get it all done in the mail on the way, and just so easy to them. Jill DeWit: Yeah. Tracking that nobody even thinks about it. It’s perfect. Thank you. Steven Butala: We’re making this sound easier than it actually usually is. I’m just being really honest. Jill DeWit: Well, we’re talking big picture about the process right now. Jill DeWit: And, just having the mindset. This is kind of a mindset week. Jill DeWit: The mindset is this should be your goal. Steven Butala: Staying On Track In Land Investing Week. Jill DeWit: Yeah. This should be your goal. Steven Butala: That’s right. That’s right, Jill. Jill DeWit: On these calls, don’t drag them out. Make a decision, by the way. This is another thing, too. Buy the property the same day the seller calls should be a for you, make a decision. You know what you want. You know it’s a good price. Don’t waffle yourself. Don’t negotiate with yourself. Just do it. Act on it. Trust that you priced it right when you sent out that mailer, and do it. Steven Butala: I’ll add this, too. Not with the crew we have now, but in the past, I’ve had people that answer the phone that have an issue with getting a price. At the offers we send out all contain a price. When I used to do it, the first question I would ask, because I would say, “Hey, great. Great. Thanks, Mr. Smith, for calling. Does the price on the letter work for you?” “Well …” Then I’d interrupt and say, “Mr. Smith, this is pretty much how this goes. I can come off of it a little bit, but probably not, so I really don’t want to waste your time at all. Whatever you need to do to make a commitment to that prices or a price that’s really close to that, we can just move forward.” Because, I’ve heard people in our office … in your office, now … they have some kind of thing about price and talking about money. Some people have that. Jill DeWit: Yeah. That’s true. Those people don’t answer the phones anymore, not for those calls. Steven Butala: Jill and I went to a car dealer, which I vowed I should never do, but we did it recently. We went to a car dealer. We got all done, and Jill said … We didn’t buy a car, because we’re not crazy. She closed the door, because the salesman said, “Oh, yeah. I’ve got two daughters and a wife, and I understand finances and how …” Jill, what was your … Go ahead. Jill DeWit: Oh, my God. Steven Butala: Because, it made so much sense. Jill DeWit: My thing is always assume everybody can afford. They wouldn’t be calling you if they can’t. Steven Butala: Yeah, I agree with you. Jill DeWit: Don’t sit there and waffle. Don’t negotiate. Steven Butala: We weren’t there … We were not making a decision on price. Steven Butala: It was like the fifth thing down the list, actually. Jill DeWit: We could care less about the price. We were there to see about the size. Can I say what it was? Steven Butala: Yeah, go for it. Steven Butala: It all centers around Jill’s gifts. Steven Butala: So much fun. Jill DeWit: Okay. The only truck that we have is a 4Runner. That’s not going to work, obviously. I don’t want to get a trailer. We found out we can just get an awesome pick-up truck, haul them right in the back. Steven Butala: Yeah. Pick-up trucks are cheap. Jill DeWit: Right. We’re go looking at the new Toyota Tundras and the … What was the other one? Steven Butala: And, the American ones. Jill DeWit: … price was a decision. Price isn’t the decision. What’s the decision? A, will they fit? B, the size of the bed. Jill DeWit: Mileage is a decision. Steven Butala: Fuel efficiency is a big deal. Jill DeWit: More importantly, comfort sitting in the cab. Jill DeWit: They’re all extended, so I was kind of interested to see how big they are. I was shocked how big they are in those things. Jill DeWit: It’s not like a … It’s a full four-door event. It was so flipping funny. That’s what we were looking at. Steven Butala: Last pick-up truck I was in with you was a 1971 GMC. It had a whole bench seat. Remember that? Steven Butala: We had fun in that for a while. Jill DeWit: It was yellow. Steven Butala: We didn’t own it. We just borrowed it, because it’s cool. Jill DeWit: Yeah. Super cool. Went to breakfast. Our friend let us drive that to breakfast. Thank you, Mark. That was really cool. Steven Butala: My gosh, we went over in time. Jill DeWit: We did. That was fun. Anyway. Steven Butala: Well, we’ve done it again. We spent another 20 minutes or so listening to the Land Academy show. Join us tomorrow where we discuss How To Establish A Daily Consistent Content Stream. Jill DeWit: And, we answer your questions posted on LandInvestors.com, our online community. It is free. Yeah, what we’re going to talk about tomorrow is, essentially, as a land seller this day in age … It’s not my favorite topic … establish some type of daily content to put out there. Steven Butala: Our most successful members have a YouTube channels. We have chosen podcast as our venue. Steven Butala: Which by the way, people ask me all the time, “Oh, you guys are just successful. You’re very successful at this real estate thing because of this podcast.” I can’t tell you how untrue that is. 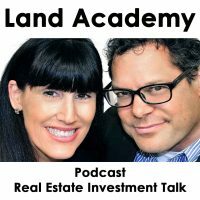 Steven Butala: I don’t think we sell a darn piece of property through this podcast. Jill DeWit: I don’t think so. I don’t know. Steven Butala: I don’t know either. Jill DeWit: Wouldn’t it be hilarious? Steven Butala: … fastest way to lose every single one of our listeners. Jill DeWit: Can you imagine? “10 acres is going for $4,999.” That would be so good. Steven Butala: Anyway, it’s important to pick one venue that you really like, whether it’s a blog or Facebook Live or something, and do it. Jill DeWit: … and inspiration.